• WHAT ARE THE AVAILABLE TYPES OF DELIVERY OPTIONS? POPULAR Online offers 2 delivery options. [Home Delivery] and [Store Pick Up]. • HOW DO I SAVE ON DELIVERY FEES? * Free Delivery for orders worth at least RM80 within West Malaysia. (Total Payment is calculated after discount. * Valid until 30 June 2019. • HOW LONG WILL I NEED TO WAIT FOR MY ORDER TO REACH ME? * During Malaysia National Public holidays, festive seasons, and any unforeseeable natural disasters, delivery lead time might be extended accordingly. * For [Without Stock] items. POPULAR Online will place the order with the respective vendor from the country of origin. However, items could be [Out of print] or may not be able to be provided by vendors, which will result in the Sales Order being cancelled / refunded accordingly. * For orders consisting of both [With Stock] & [Without Stock] items, delivery lead time will be calculated based whichever items require a longer lead time. E.g. A Sales Order with 3 Books, 1 with stock (3 days), 2 without stock – 1 from Taiwan (24 days) and 1 from China (60 days). The estimated delivery lead time for this Sales Order is [60 days]. E.g. A Sales Order with 3 Books, 1 with stock (9 days), 2 without stock – 1 from Taiwan (30 days) and 1 from China (65 days). The estimated delivery lead time for this Sales Order is [65 days]. • CAN I REQUEST TO SEPARATE MY SHIPPING IF MY ORDER HAS BOTH STATUS [IN STOCK] AND [OUT OF STOCK] ITEM? Sorry, if your order is in one order number, no partial delivery shall be provided. If you wish to get the [In Stock] item first, we recommend you separate the [In Stock] and [Out of Stock] items, so that we can process the ‘in-stock’ order first. • CAN MY ORDER SHIP TO OTHER COUNTRIES? Sorry, currently POPULAR Online delivers to Malaysia and Singapore only. • DO YOU HAVE A PURCHASE LIMIT FOR STORE PICK-UPS? There is no limit on the quantity for store pick-ups. But we suggest that if you want to purchase more than 20 pieces of items, please contact our POPULAR Online customer service hotline at 603-8961-0048 or 603-8961-0131 to make the necessary arrangements. • IS THERE A TIME LIMIT FOR STORE PICK-UPS? CAN I REQUEST RE-DELIVERY? As POPULAR’s bookstore storage space is limited, we suggest you collect your parcel within 3 months. If your item is not collected within 3 months, it will be returned to POPULAR Online Malaysia. If you require your item to be re-delivered, you will be subjected to additional shipping charges. The delivery fees depend on the delivery option. 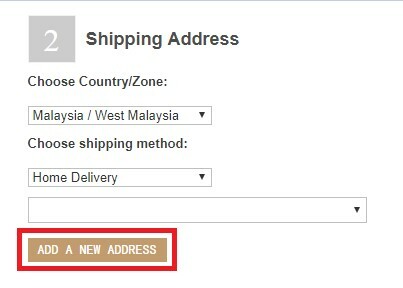 • HOW DO I CHANGE MY SHIPPING ADDRESS? 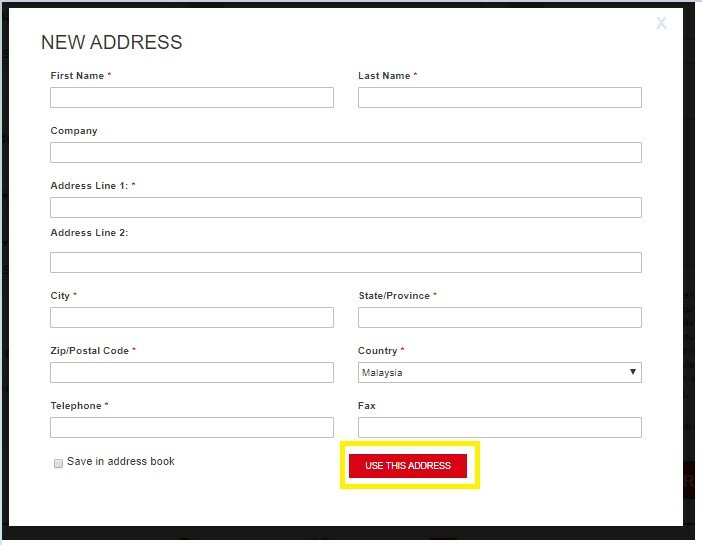 Step 1: Click (Note 2) "Add New Address"
Step 2: Fill in the relevant information and click "Use this address"
Step 1: On the Address Book Page, click "Add New Address"
Step 2: Fill in the relevant information and click "Save Address"
• WHAT IF I NOTICE I HAVE WRONGLY KEYED-IN MY DELIVERY ADDRESS AFTER COMPLETING MY ORDER? Please contact us via email within 8 hours. Your shipping address will be changed as requested. Please be reminded that your shipping address cannot be changed after the parcel has been shipped out. • IF MY ORDER CONSISTS OF [IN STOCK] AND [OUT OF STOCK] ITEMS, CAN I GET THE [IN-STOCK] ITEMS FIRST? Sorry, if your order has both in-stock and out-of-stock items, your parcel cannot be shipped separately. If you wish to get the In-Stock item first, we recommend you separate the [In Stock] and [Out of Stock] items; so that we can process the ‘in-stock’ order first. • I HAVE MADE MY PURCHASE ONLINE, YET I SEE THE SAME BOOKS AVAILABLE IN YOUR PHYSICAL STORES. CAN I COLLECT IT AT THE PHYSICAL STORE? Sorry, you may not do that. POPULAR Online and POPULAR bookstores use separate inventory accounts and systems. So, you cannot collect ordered items from a physical store’s inventory. Once the item is shipped out, POPULAR Online will notify you by e-mail of your order number, courier company information and courier tracking number. You can also go to [My Order] to check your order status. Or, you may contact our POPULAR Online Customer Service hotline at 603-8961-0048 or 603-8961-0131 to check with our staff. • HOW DO I KNOW THAT MY ITEM HAS BEEN SHIPPED AND HAS ARRIVED AT THE POPULAR RETAIL STORE? After your parcel has been shipped out, you will receive a system generated [Shipping Notice], to notify you of your parcel’s status. Please bring your e-mail along as a verification document to collect your item. You can collect within 7 days, or as indicated in the email from the respective store. • WHAT SHOULD I DO WHEN THE STORE I SELECTED AS THE PICK-UP POINT HAS CLOSED DOWN OR IS TEMPORARILY SHUTTERED? After you have completed your order, if the originally chosen store cannot provide the above-mentioned service, POPULAR Online Customer Service will send a notification e-mail regarding the changes. Please re-select your preferred store and reply to our customer service, and we will re-arrange accordingly. • WHY CAN’T I FIND THE DESIRED STORE FOR STORE PICK-UP? If your chosen store cannot be found in the selection bar, possible reasons include: store undergoing renovation, system settings changed, store information updates, new store information is not yet update etc. (does not necessarily mean that the store has ceased operating). Please choose another store. • WHAT SHOULD I DO IF I GO TO THE STORE TO PICK UP BUT MY PRODUCT IS NOT THERE? Please contact our POPULAR Online customer service hotline, so that we can check and verify with the pertinent store about your parcel’s status. * This is to remind you that when you arrive at the store, please show the [order delivery notice] e-mail with the "recipient's name” (please mention the name as indicated in the e-mail). * As your parcel is fully paid for upon collection, for your protection and to ensure a genuine collection, please present your shipping notice and identification card as part of the collection verification process, when you visit the pertinent outlet for your collection.